Alstom is about to ship fifteen of its modular Coradia Polyvalent regional trains to Senegal on the West African coast. They have been manufactured at the company’s Reichshoffen facility in France. 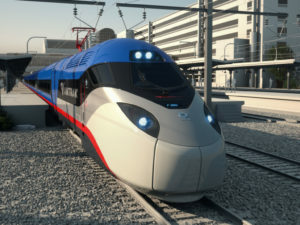 The trains have also successfully completed on-site testing and approval by the buyer, APIX. France and Senegal have good trading relations. Both countries are members of the Francophonie, an international body representing countries where French is the lingua franca, where a substantial percentage of the population speaks French or where there is a significant affiliation with French culture. Senegal is France’s third-largest trading partner in Africa. France is also Senegal’s largest foreign investor. The first of the multiple units will be transported from Reichshoffen in northeast France to Le Havre in Normandy. Once there it will be loaded on to a vessel that is due to arrive in the Senegalese capital of Dakar in three weeks’ time – on 12 November. The bogies will be re-fitted on to the cars at the Colobane maintenance depot just outside of the city. Then the rolling stock can undergo static and dynamic testing. The rolling stock ordered by APIX is versatile in that it can operate both on diesel and in electric mode (25kV). The maximum speed of the multiple units is 160km/h. Each train comprises of four cars and has a total length of 72 metres. The trains have both first and second class with a maximum passenger capacity of 531.